The Smell Of The Conspiracy, Is In The Numbers! 13,11 and 33 The Zionist Illuminati, Signature. 1 2 3 4 5 6 7 8 9 10 1112 13 14 15 16 17 18 19 20 21…. According to Muslim Sufis, number 11 is the number that represents God, because According to the Sufi analogy the real name of God is Howa, which is made of two consonants the “H” and the “W” and according to the Arabic and the Hebrew alphabets the total value of those two letters are 11, that’s (H as 5 + W as 6 = 11 HoWa). When the Zionist Illuminati under girded a key event using the occult signature of the number 11. When the Zionist Illuminati ended the First World War, they had just successfully completed the first war of Albert Pike's occult plan to produce the kingdom if Satan. Thus, they deliberately ended it on the 11th Month [November], the 11th Day, at the 11th hour. The signing of the Armistice agreement was thus under girded by three elevens! When the Zionist Illuminati assassinated President Kennedy, he was killed according to the occult number signature of eleven. He was killed in the 11th month, on the 22nd day, and on the 33rd parallel. He was also killed in the Masonic Dealey Plaza, the most powerful secret society in the world today to whom the number 11 is extremely important. The Number 11 was a most powerful occult signature underlying this entire event. When it was successfully carried out, occultists the world over knew exactly what had happened and who had carried it out. We have zeroed in on the number 11, because this tragedy is under girded by this number. And by their actions they used number 11 to present all that is sinful, harmful, and imperfect of their evil plans. Thus, while 11 is very important, multiplications are also important, such as 22, 33, 44, 55, 66, 77, 88, and 99. However, this occult and Zionist Illuminist preoccupation with the Number 11 as they strive to produce their satanic kingdom, is dictated by Biblical prophecy concerning Antichrist. With this background in mind, let us examine the various elevens under girding this terrible tragedy. 1) The first 11 is formed by the day on which this tragedy occurred, September 11. 2) The second 11 is formed by adding the 9th month, September, and the date, [1 plus 1], forming another 11. 3) The third 11 is formed by the airplane number that first crashed into the World Trade Tower. That plane was American Airlines Flight #11. 4) The fourth 11 is formed by the airplane number that crashed into the Pentagon. That plane was United Airlines Flight #77 [11 x 7]. 8) The eighth '11' is formed by one of the doomed flights, where the crew totaled '11'. 10) The tenth 11 is formed by the historic fact that New York State was the 11th state to join the Union in preparation to create the 13-state confederation that would declare independence from England, that’s why they chose New York to perform their largest conspiracy. 11) The eleventh '11' by the Architecture of the Twin Towers of the World Trade Center -- Satanists love to express their beliefs and their goals in architecture. Thus, many of the buildings of Washington, D.C., were created originally with occult symbols on them, and in them. This fact is the reason why the street designs are created in such a way as to form satanic symbols. The streets north of the White House form an inverted Pentagram, the Goats head of Mendes, while the streets joining the White House to the Capitol form one side of a Masonic Compass, while other streets form the Masonic Square and Rule, look at capital hill from the air you will see a goat head. George W. Bush says he saw the North Tower impact before he went into the classroom in Florida, but he continued listening to a little girl's story about a Goat, and about a Calf that went mad). * When President Bush visited New York City on September 16, he was pictured with a firefighter who was wearing a helmet with the numbers, 164', which when added together, form an '11'. * During the crisis, kids in the area of the Twin Towers were moved to a "safe school" on 11th Street. * The only operating ferry was Number 11, on 33rd Street. This very strong numeric signature on this attack clearly sends a signal to the rest of the occult world that this event wasZionist Illuminist, and that it signaled the beginning of a further series of events that will bring the world to the coveted Third World War that will produce world war III. Further, the massive usage of this number clearly indicates that significant individuals in United states and the world have been will informed to play their programmed role in helping this conspiracy succeed, for their New world order. Satanists really do believe in creating symbols on the ground as a planed message. Thus, we find it highly interesting that the Twin Towers of the World Trade Center form an 11. If this disaster was intended to be the first blow in the planned Third World War to produce NEW WORLD ORDER, then the most appropriate symbol in the world to hit was a symbol of an 11. Occult author has stressed that the old system must die, just as the Phoenix Bird dies, totally burned to ashes, so another Phoenix Bird can arise a new and a fresh from the ashes, but this time it will rise with fire in its hart to burn every Muslim. America's Leadership of the New World Order. The original national bird envisioned by Masonic leadership back in the late 1700's was not the American Eagle, but the Phoenix Bird. This historic fact strongly suggests that, at the right moment in world history, with the world entering through the portals of the New World Order, Kingdom of Antichrist, America might suddenly be immolated in fiery flames, burning to the ashes; out of these ashes, the New World Order would arise. America is the Economic Babylon of Revelation. This Economic Babylon is destroyed by God's judgment in great fiery destruction in one hour of one day. Zionist Illuminati plans to rid itself of the world's greatest consumer of commodities and manufactured goods. occult author has lamented this fact, and has stated that, because the United States refuses to stop being a High Entropy user, that Mother Gaia [Mother Earth] would begin a "cleansing action" against this country. To the Zionist Illuminist mindset, there is no better target on earth to hit in this struggle to bring world war III and initiate the New World Order than the Twin Towers and the Pentagon. This tragedy has six sets of 11 associated with it. When you multiply 6 times 11, you get '66', this number they intentionally use it for every evil act they plot, in order to blame it on God. Interestingly, there is another occult number associated with this event. The second tower hit was struck by United Airlines Flight #175. This number, when added together, equals 13. The calculation is thus: 1 + 7 + 5 = 13. Thus, the Twin Towers were hit with planes carrying the occult signatures of '11' and '13', the two most important numbers in the entire occult world! The number '11' symbolizes all that is evil and imperfect [The Old World Order] and the number '13' signifies rebellion against God's constituted authority! Masons worship toward the East, because they are pagan Sun worshippers. Ezekiel (8, 13-18); 13 ¶ He said also unto me, Turn thee yet again, and thou shalt see greater abominations that they do. 14 Then he brought me to the door of the gate of the LORD’S house which was toward the north; and, behold, there sat women weeping for Tammuz. 15 Then said he unto me, Hast thou seen this, O son of man? turn thee yet again, and thou shalt see greater abominations than these. 16 And he brought me into the inner court of the LORD’S house, and, behold, at the door of the temple of the LORD, between the porch and the altar, were about five and twenty men, with their backs toward the temple of the LORD, and their faces toward the east; and they worshipped the sun toward the east. 17 Then he said unto me, Hast thou seen this, O son of man? Is it a light thing to the house of Judah that they commit the abominations which they commit here? for they have filled the land with violence, and have returned to provoke me to anger: and, lo, they put the branch to their nose. 18 Therefore will I also deal in fury: mine eye shall not spare, neither will I have pity: and though they cry in mine ears with a loud voice, yet will I not hear them. The single most important, symbolic, and venerated symbol among the Egyptians was that of the sun. Most of the principal gods of Egypt were associated with the sun in some phase of its journey through the sky or its journey through the underworld at night. The sun itself was revered as a god, first under the name Horus (the sun was the eye of Horus), later as "RE", and then Amun-Re. Both Horus and Re were falcon-headed gods; the sun is the Horus's eye, but Re wears the sun on top of his head). But, in the Masons Lodges, the North is empty as a symbol of their belief about that direction. The Bible states that God sits on His throne in the north [Isaiah 14:13]. Albert Pike describes this belief: "To all Masons, the North has immemorially been the place of darkness; of the great lights of the Lodge, none is in the North." [Morals and Dogma, p. 592]. By striking the North Tower first, the Zionist Illuminist Masons guiding this world into the New World Order may have been symbolically striking at God and His system, the Old World Order! Now, when you tie these two understandings together, you can see why the first blow came from a plane designated '11' and why it hit the North Tower first, North being the direction of God's throne. From the occult standpoint, this all makes eminent sense! This occult Zionist Illuminist signature tells us exactly who is behind this terrible event. If “USAma bin Ladeen” is the face cover of their operation, he is just acting his role as the bogey man, in compliance with the wishes of the Zionist Illuminati. If American, British, and Israeli Intelligence really wanted a man out of the way, they would get him no matter how rich or powerful or protected he might be, President Kennedy’s Assassination is a good example. “USAma bin Ladeen” is alive today only because the Zionist Illuminati want him to be alive, he is their valuable friend. (Also Saddam Hussein, if they really want to kill or get rid of Saddam Hussein they could have done that long time ago, they didn’t need to kill millions of Iraqi children or a 14 year choking sanctions. The expert assassins in the CIA, Israeli Mussed or Zionist Illuminati, are killing people with very advance precision glided missiles every day, SO if they really want to kill Saddam Hussein, he would not be alive today? Or is he too valuable to kill, because he is the reason for their valuable bases in the gulf, he is the green light that gives them the stupid worlds permission to hit the Iraqi public any time, and every time and to choke the Iraqis to death, and all the ignorants in the UN will say, “OK NO BROBLEM”, to invade Iraq, slaughter the Iraqis and rob the country and oil). Where might we go from here? Events have to be watched carefully. We believe this tragedy may be just the beginning of the planned Third World War. *Zionist Illuminati attacks in the name of Arabs or Muslims against American cities, possibly even using unusual weapons, such as nuclear, chemical, and biological weapons. New Age author Bill Cooper says that this plan calls for New York City to be hit with nuclear devices. *Natural Disasters: *One New Age author says that Los Angeles is planned to be hit with a huge, unprecedented 9.0 earthquake. Remember, both American and Russian militaries can deliberately cause earthquakes. (H.A.R.P) *Western economies and stock markets crash. *The American President will declare a National Emergency. This declaration will automatically invoke all the fearsome powers of all those Presidential Directives -- Executive Orders. Under these powers, the President can become a virtual dictator, seizing control of all transportation, communications, food supplies, and declare state of emergency and Marital Law. Western peoples generally and Americans specifically, are to be so panicked they will accept any plan from the US President that will seemingly lead them out of this terrible series of crises. Americans will jump for joy at losing their freedoms, the US Constitutional form of government, if they believe that such a loss will restore calm and prosperity. Of course, they will be told that they will get there freedoms back once calm and security is restored, and they shall naively believe it. Will it make there imprisonment and there loss of Liberty any less painful because it is coming at the hands of a "Christian", compassionate President? Will it be any less painful to surrender there freedom to the forces of a "New Born Christian" Attorney General? Notice that the Bilderberg Group has core of 39 members who are broken into 3 groups of 13 members in each group. Notice that the core of 39 answers to the 13 who make up the Policy Committee. Take special notice that the 13 members of the Policy Committee answer to the Round Table of Nine. On May 13, 1981 an assassination attempt was made on Pope John Paul II. John Daniel, author of Scarlet and the Beast shows probable evidence of Freemasonry involvement by a Masonic Lodge called Propaganda Two (P-2), which incidentally has been accused of assassinating Pope John Paul I. (Daniel, John. Scarlet and the Beast, Vol. I, p. 220). May 13, 2000 Putin divides Russia into 7 districts in preparation for? The Cuban missile crisis lasted 13 days, which suggests a ploy or fake crisis. 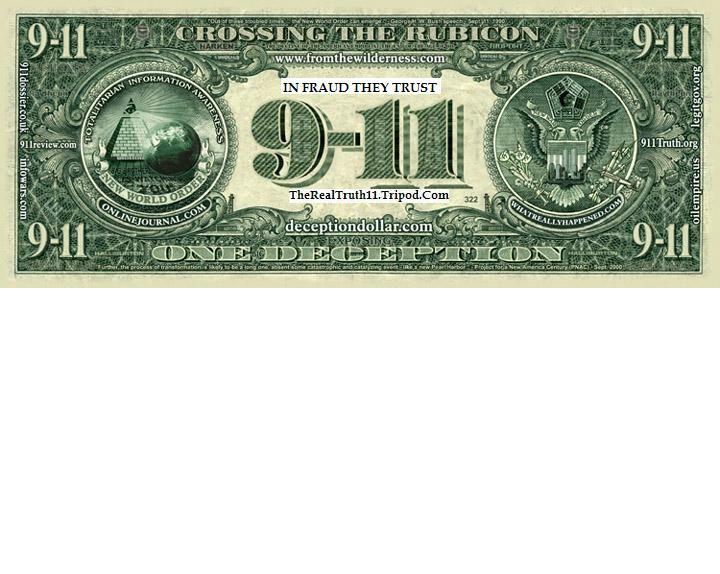 "The significance of the “mystical” number 13, which frequently appears upon the Great Seal of the United States, is not limited to the number of the original colonies, in history those who signed the declaration of independence ware 9 not 13. The sacred emblem of the ancient initiates, here composed of 13 stars, in the shape of the Jewish star, also appears above the head of the 'eagle.' The motto, E Pluribus Unum, contains 13 letters, as does also the inscription, Annuit Coeptis. The 'eagle' clutches in its right talon a branch bearing 13 leaves and 13 berries and in its left talon a sheaf of 13 arrows. The face of the pyramid, exclusive of the panel containing the date, consists of 72 stones arranged in 13 rows." That is the case with the Great Seal of the United States. The various 13's represented throughout the seal, taken into account with the other symbolism involved, leads to the evidence of Zionist Illuminati influence. Benjamin Franklin was a Templar Mason as well as some member of congress, and it was he who was most influential in the design of the seal. "All names, missions, landing sites, and events in the Apollo Space Program echo’s the occult metaphors, rituals, and symbols of the Zionist Illuminati's secret religion." One example, the explosion of the Apollo 13 spacecraft, name 'Aquarius', had a broblem, which occurred at 1:13 in the afternoon. (1313 military time) on April 13, 1970. IS THE DESTRUCTION OF THE SPACE SHUTTEL COLOMPIA, FLIGHT NUMBER 113TH OF THE SPACE SHUTELS FLIGHTES, THE 88TH FLIGHT AFTER THE DESTRUCTION OF CHALENGER, AND THE CHALENGERS ACCIDENT WAS THE 88TH FLIGHT SINCE THE BEGING OF THE SPACE EXPLORATION FLIGHTES, Mars Pathfinder landing site (19.5° N by 33.3° W) - July 4th, 1997. * The OPEC oil cartel has 13 member nations. * "Every night when the moon is full, pagans and Satanists, all across America celebrate the Black Sabbat (Latin for Sabbath). To insult Prophet Jesus and the 12 Apostles, each unhallowed gathering includes a Black Master and 12 coven members for a total of 13. "During the Salem, Massachusetts witch trials of 1692, 13 women were executed. The Movie entitled "13 Days." Many movies have the number 13 in the title. -6 Days and Seven Nights with Harrison Ford. 6+7=13.- Holywood even have a rating for movies PG-13. In case you didn't know it, Hollywood is owned by the masons. John Wayne was a mason. This was Hollywood's way of glorifying the mass murder of the American Indian race of people. Same way in Germany. Gene Rodenberry creator of Star Trek series was a mason. Even the name Vulcan was the name of a false Roman god. The communicator in Star Trek, is a pyramid.. They always slip the numbers 13 or 33 in somewhere, another example is the movie On Any Given Sunday, the quarter back was number 13 and the receiver was number 33. Who could miss the all seeing eye through-out the movie. Even the movie The Last Boy Scout with Bruce Willis and Damon Wayans. Damon had the number 13 on the back of his head. What was he in this movie? A forced retired quarterback looking for payback! In their mind they are talking about satan that was forced to retire? You might as well watch the plans of the 9/11 attacks long before it happened, in the movies Space Troopers, The Long Kiss GoodNight, also the movie Enemy of the State, Siege and many other movies, The Movie Lord of the Rings, summarizes the history of Zionist Illuminati and the Zionists devil worshipers concealed through out the movie. Also matrix 1, 2, 3 (for details go to chapter 13 of this book). CPC/EAN 13 Bar code system. Vice President Gore conceded on the 13th day of December, which officially made Bush president on the 13th day, which suggest a ploy to bring about 9/11. The United States has been divided into seven different regions geographically. Each region has a 13 member leadership council that coordinates with the local leadership councils. In a similar fashion, JFK, Jr., was killed and committed to the waters of the Atlantic close to the intersection of the N. 41 parallel and W. 71 meridian; summing up, 4 + 1 + 7 + 1 = 13, the most Masonically correct number. This intersection, southwest of Martha's Vineyard, is also close to the small island called No Mans Land. "No Mans" is a Baconian cipher for "Mason", Mason Land. This island is close to the intersection of the N. 31 parallel and the W. 81 meridian; again, 3+1+8+1 = 13 This is the completion of the sacred geometry of the Priory of Sion. One of the secret codes is the alphabet with a number above each letter. Starting with the letter A with the number 1 ending with Z which would represent the number 26, that’s the base of the English cabala. McDonald’s restaurant. The big golden M is the 13th letter of the alphabet. Fritz in his has already proven the McDonald's are associated with these Satanic families. “Do you see the 13 in these logos? The owner of the Pittsburgh Steelers is a Knight of Malta. The owner of the Detroit Lions is a Knight of Malta. All your top owners of these ball clubs, for the most part, are Knights of Malta, getting the people whooped up in this hoopla over games and sports, while they’re busy creating a tyranny. So, that was one of the things in the Zionist Illuminati protocols that they would create "amusements". Another one they used was the Disney 33rd-degree Freemason-Disneyworld, Disneyland. Another one was Milton Hersey, with Hersey Park. They create all of these amusements and games and pastimes to get the people drunk with pleasure, while they’re busy over throwing the God form of government. Aryan ancestors were sanctified with the Zaothra, ( Zoroastrian religion is the same as the Luciferian polytheistic religion of Mazdaism, with its chief god being Lucifer going by his alias Ahura-Mazda), or consecrated water, and there-by devoted to the service of Ahura. All Mazda trucks have 13 gallon fuel tanks. Mazda is not the only automobile manufacturer to use ancient pagan god symbolism. In cultic/Satanic doctrine represents the spirit of Lucifer in a goat hed just like the new Dodge Logo. Dodge Ram Trucks. A rams horns turns downwards. This logo cleverly makes it a goat head with the horns upward to represent the goat head. What does financial chaos lead us to?. The legal system is owned by the masons. Most of the United States Supreme Court Judges have been Mason. see: The Judges are listed there. 12 jurors and one judge =13. There is no law anywhere that requires 12 jurors. So why 12? Proctor & Gamble vigorously denies the accusations, contending that the horns are merely curls of hair? In 1992, Proctor & Gamble decided to slightly revise its bizarre and troublesome logo. But rumors and questions still remain. In any case, soap-maker Proctor & Gamble has filed lawsuits against several people believed to be responsible for spreading the allegations of devilizm. But, in at least one of the lawsuits, the company raised eyebrows when the news came out that Proctor & Gamble was seeking exactly $66,600 in damages! U. N. United Nations There are 33 sections to the United Nations on the inner emblem logo. Harry S. Truman. As the 33rd President, this 33rd degree Mason initiated the Nuclear Age, the crowning success of alchemy, when the first A-bomb exploded at the 33rd Parallel Trinity Test Site, Alamogordo White Sands, and New Mexico. He was responsible for killing of hundreds of thousands of Japanese (the Yellow Peril) at two cities close to the 33rd Parallel, Hiroshima and Nagasaki. UK= 21,11 =2 & 1 , 11 = 3 & 11= KKK=33 United Kingdom. 1+2=3 3 make 33 A B C, 1947 On July 8, 1947 a UFO and aliens' bodies were allegedly found in the desert outside Roswell, New Mexico at the 33rd Parallel, On August 19, 1946, which indicates a ploy to deceive the public. WHEN ENGLAND GOT RAPED BY SATAN! ENGLAND GAVE BIRTH TO ISRAEL! U.S GOT HIJACKED BY THE SONS OF SATIAN! Since it has been proven that most of the 33rd degree Freemason's worship Lucifer this 13 and 33 is a homage to their god. The 33 degrees was no mistake Its like the temperature, 32 and below is frozen ‘not knowing at 33 it ‘thaws knowing’. It got adopted few months before the 9/11 attacks. city Bank, City is spelled Citi ! The arch on top of the ‘t’ looks like a temple arch! Can you guess what the ‘t’ stands for? What city are they talking about? Dose it stand for Jerusalem. More New World Order Symbolism (aka) Illuminati The Sun Rays (Sun Worship) aka freemasonry. On 3/22/04 the Israeli leader Sharon him self, directed the assassination of the handy caped 67 year old Ahmad Yaseen, Date = 3 x 22 = 66, age 67 = 6 + 7 = 13. NIKE AIR Nike the worlds famous shoe making company launched a product in which the word "AIR" was written in such a way on the backside of the shoe, if observed looks as Allah ‘God’, written in Arabic. on November 22, 1307." Thus, Icke believes that Freemasonry Knights Templar finally exacted its long-awaited revenge by killing the only Roman Catholic President this country has ever had, on the anniversary date of the attack on Knights Templar, and in a specific satanic ritual called, The Killing of the King (after this killing they tried to frame it to Oswald, then Oswald was killed before he can prove his innocence, by Jack Ruby, born Jacob Rubenstein (Jewish). - September 11, 1990 -- President Bush [Senior] gave speech to a joint session of the U.S. Congress entitled, "Toward A New World Order". On this date, President Bush gave a speech to a Congress and to an American people who were in an uproar over the Iraqi invasion and wanted to learn more of the gathering military response from a tough-talking American President. Once again, Bush presented the rationale for his military response, and held out the hope that the world would be able to use this event as a catalyst to propel us into the global cooperation peace, and safety that the New World Order promises. Precisely 11 years to the day after President Bush [Senior] gave his address to Congress entitled "Toward A New World Order" [9/11/1990], the attack on the World Trade Center and the Pentagon occurred. This attack was also under girded by a tremendous number of 11's, so many as to attract the attention of the entire world. In fact the attention to the prevalence of the number '11' in this attack grew so wide spread that the Mass Media Spin Control apparatus had to kick into high gear in order to try to debunk the concept that this event was planned by someone other than Illuminati. Once again, we see two (2) eleven's present in this date. Not only is the day an '11', but adding the month and the day in the occult manner equals another eleven [1+1+9 = 11]The Illuminati always leaves some occult signature when they carry out an event, especially one designed to move the world into the Kingdom of Antichrist, i.e. New World Order also known as Aquarius. ETERNAL FLAMES DEDICATED TO ONE OR MORE WORLD WARS -- Throughout this great country, numerous examples abound of eternal flames gracing the memorials to World Wars I and/or II. If you took note of this fact, you are right, and the symbolism is exactly the same as described above. Both World Wars were fought as Illuminist wars to bring about the Kingdom of Antichrist! In order to demonstrate to fellow occultists the world over that the First World War of Pike's satanic plan had been successfully concluded, the Illuminati arranged for the Armistice ending the war to be signed at the 11th hour, of the 11th day, of the 11th month “KKK“. Masonic leader, Albert Pike, had a satanic plan in 1870, in which he planed three (3) world wars needed to be fought in order to successfully stage Antichrist. Each of the first two world wars were started, were fought, and did achieve the goals, of this plan. * When President Bush visited New York City on September 16, he was pictured with a firefighter who was wearing a helmet with the numbers, 164', which when added together, form an '11'. * President Bush orders U.S. flags to be flown at half-staff under September 22 [11 x 2, also 9/22 = 9 + 2 +2 = 13]. This date means that the flags will fly at half-staff for 11 days. Truly, the peoples of the world are witnessing the New World Order being initialized right in front of our eyes! Further, the massive usage of this number clearly indicates that significant individuals in our country have been mind programmed, so they will react to such a programming number. The plan to destroy the Twin Towers, was known to the CIA and other parts of American Intelligence knew of the plan also. Let us give you a few examples of when the Illuminati under girded a key event using the occult signature of the number 11. When the Illuminati ended the First World War, they had just successfully completed the first war of Albert Pike's occult plan to produce Antichrist. Thus, they deliberately ended it on the 11th Month [November], the 11th Day, at the 11th hour. The signing of the Armistice agreement was thus under girded by three elevens! When the Illuminati assassinated President Kennedy, he was killed according to the occult number signature of eleven. He was killed in the 11th month, on the 22nd day, and on the 33rd parallel. He was also killed in the Masonic Dealey Plaza, the most powerful secret society in the world today to whom the number 11 is extremely important. The Number 11 was a most powerful occult signature underlying this entire event. When it was successfully carried out, occultists the world over knew exactly what had happened and who had carried it out. We have zeroed in on the number 11, because this tragedy is under girded by this number. Why is the number 11 important to the occultist? As Wescott explains, "... so 11 is the essence of all that is sinful, harmful, and imperfect." Thus, while 11 is very important, multiplications are also important, such as 22, 33, 44, 55, 66, 77, 88, and 99. However, this occult and Illuminist preoccupation with the Number 11 as they strive to produce their Antichrist, is dictated by Biblical prophecy concerning Antichrist. With this background in mind, let us examine the various elevens under girding this terrible tragedy. 7) The Architecture of the Twin Towers of the World Trade Center -- Satanists love to express their beliefs and their goals in architecture. Thus, many of the buildings of Washington, D.C., were created originally with occult symbols on them, and in them. This fact is the reason why the street designs are created in such a way as to form satanic symbols. The streets north of the White House form an inverted Pentagram, the Goats head of Mendes, while the streets joining the White House to the Capitol form one side of a Masonic Compass, while other streets form the Masonic Square and Rule, look at capital hill from the air you will see a goat head.